The next class of players to join the Dallas Cowboys may be on the field at Mobile, Alabama this week for the Senior Bowl, but their young core is well represented in front of the Cowboys coaching staff at the Pro Bowl. With Left Tackle Tyron Smith and Right Guard Zack Martin not participating, the Cowboys have six Pro Bowl participants. The improved health of their offensive line is still one of the best things going for this team in the early part of the offseason, expecting four-time Pro Bowl Center Travis Frederick to rejoin Smith and Martin as soon as OTAs. A compilation of the best linemen in the NFC will have to do for Quarterback Dak Prescott and Running Back Ezekiel Elliott - making their second Pro Bowl appearance together. 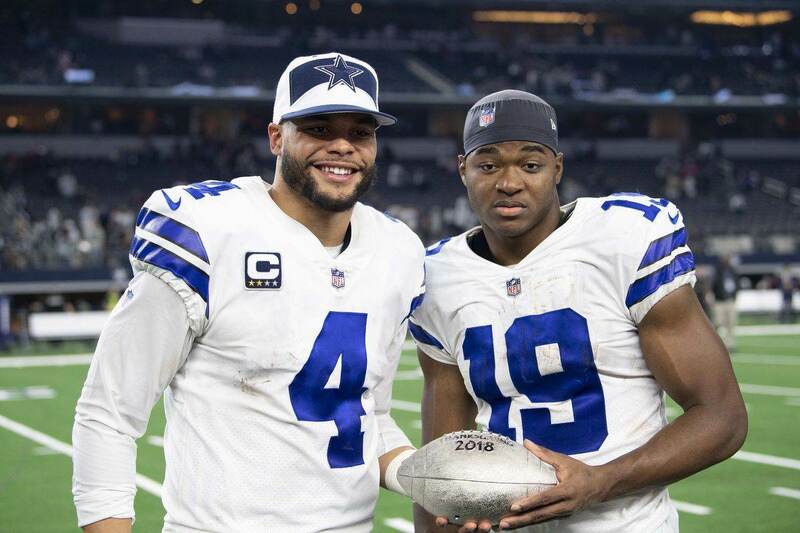 It took the addition of Wide Receiver Amari Cooper for the Cowboys offense to find their expected form under Prescott and Elliott in their third season, as Cooper will appear in his fourth Pro Bowl in as many years. Both times Elliott's made the Pro Bowl, he's done so as the league's rushing champion. Hardly on track to reach Orlando with the Oakland Raiders, Cooper put up 725 yards and six touchdowns on 53 catches in nine regular season games for the Cowboys. He followed up this resurgent performance with seven catches for 106 yards in the Wild Card Round vs. the Seahawks and six for 65 and a touchdown at the Rams in the Divisional Round. The Cowboys shouldn't be done adding talent at wide receiver, with Cooper serving as the bold reminder of what Prescott can do with dynamic talent on the outside. Moving on from Offensive Coordinator Scott Linehan already this offseason, the next steps towards building the offense around Dak's strengths is yet to be determined. Meanwhile, their established strengths will be on display, and not just on offense at the Pro Bowl. Making strides as one of the best young defenses in the league this season, Cowboys rookie Linebacker Leighton Vander Esch will be joined by Defensive End DeMarcus Lawrence and Cornerback Byron Jones. Though its unlikely their coaching will match the intensity of the season, the best thing these three defenders have going for them is more time under Passing Game Coordinator Kris Richard. One of Richard's first moves with the Cowboys was moving Jones to cornerback, where he became a first-time Pro Bowler. Unable to reach his full athletic potential at safety, Jones was the elite corner the Cowboys needed at a position still in need of depth. His length and range should make him a fixture in Richard's secondary for a long time. Vander Esch becomes the 11th Cowboys rookie to make a Pro Bowl, the third on the defensive side of the ball. Surely the Wolf Hunter will look forward to another week of football, going from eight man HS player to one-year starter at Boise State and finally a Cowboys fixture at linebacker. The Cowboys did what was thought to be proved impossible this season by fielding a competent defense (mostly) without Sean Lee. Vander Esch and teammate Jaylon Smith deserve the credit here, with Leighton making a larger immediate impact than ever expected as the 19th overall pick. Last but nowhere near least is DeMarcus Lawrence, much closer to the Cowboys top priority in free agency this offseason than an afterthought at his second Pro Bowl. Putting together consecutive seasons with at least ten sacks, the Cowboys don't have to see anything further from their top pass rusher to do whatever it takes to re-sign him. The rest of the Cowboys "Hot Boyz" have a lot of potential and promise, but Lawrence is a rare proven commodity at defensive end with 25 sacks in his last 32 games. Rushing the passer in the Pro Bowl is a relatively futile task, but the Cowboys know Lawrence is capable of saving his best plays for the biggest moments. Also a dominant run defender, there simply shouldn't be a reality where the Cowboys are forced to field a defense without Lawrence at left end in 2019 and beyond. The Cowboys at the Pro Bowl will tell you they'd prefer to be missing the game in preparation for the Super Bowl. Getting within two games of this feat after a 3-5 start is still impressive enough for the Cowboys to feel great about their future, in large part because of the six players representing America's Team this week. Tell us what you think about "Dallas Cowboys Pro Bowlers Show Promise for Future" in the comments below. You can also email me at Sean.Martin@InsideTheStar.com, or Tweet to me at @SeanMartinNFL!